Tonight, for dinner, I made stuffed Pizza Rolls. Started off by making the pizza dough in the afternoon. You can, of course, just use store-bought pizza dough. I do that plenty of times when I’m making Pizza at home. I just decided to make this on a moment’s whim and had none at home to work with. Next, add in the oil, salt, and two cups of flour. Blend, on medium speed, for about three minutes. Then, add the remaining two cups of flour to the mixture and form the dough (the consistency is so much better this way). Knead for about five minutes on a floured surface. Cover [with a damp paper towel] and let it rise [I put mine in my oven that wasn’t turned on]. I let it rise for two hours [and would suggest you do it for at least the same amount of time frame]. The reason I suddenly decided to make the stuffed pizza rolls today was I had a couple of chicken breast fillets leftover from something earlier and I wanted to use that up. I originally thought about making my Cajun Chicken Pasta [I can’t believe I haven’t posted the recipe for that yet!! ], but I didn’t have enough chicken for that. These Stuffed Pizza Rolls is what popped in my head next. You can, of course, add in salt if you want — with so many different herbs I didn’t think it needed any! With non-stick cooking spray, I cooked the chicken on very low heat. Watch the skillet! The chicken is in such tiny pieces that it will cook in absolutely no time! In a bowl, I combined the [cooked] chicken with shredded mozzarella cheese, crushed red pepper flakes, Italian seasoning, and chopped up peppers [in varying colors]. The pizza dough that you made earlier? Take tiny pieces of them, fill in with your filling, and form a ball around the filling. Lay them in a non-stick baking pan. With my homemade dough, I was able to make 13 ‘rolls” each in two round baking pans. When all the “rolls” were made, I covered the pans each with another damp paper towel and put it back in the [still turned off] oven for another 60 to 90 minutes to let the dough rise for a second time. When you are ready to bake, take your baking pans out of the oven before preheating your oven to 400 degrees. Next, brush the top of your “rolls” with a little oil. Then, combine about 1 teaspoon of garlic powder, 1 and 1/2 teaspoons of Italian seasoning, and about 3 tablespoons of grated Parmesan cheese. Sprinkle the tops, evenly, with the mixture. Bake, in your preheated oven, for about 20-25 minutes. Keep an eye on them, as cooking time will vary depending on the ovens and the pizza dough used. The Stuffed Pizza Rolls are ready to be taken out when they are golden brown on top. Serve the Stuffed Pizza Rolls warm alongside warm marinara sauce! Note: I considered adding marinara sauce inside, instead of serving it on the side, but ultimately decided not to because I didn’t want to have to deal with the mess the sauce would create as I rolled up each into a ball. Oh my goodness this looks super simple and YUMMY! Need to make it soon, thanks for sharing! Thanks Christi! 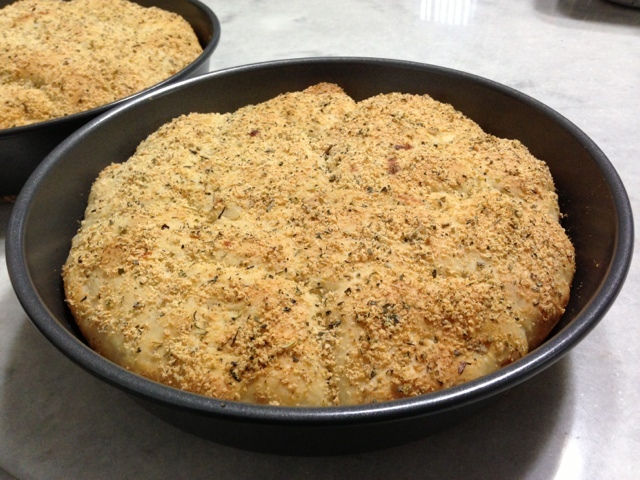 It is, surprisingly, easy to make… and it was delicious! Hope you like it as well! They look great, absolutely delicious! Thanks Ambreen, they turned out great! oooohhhhh! This sounds tempting! Pinned 🙂 Thanks for sharing on Two Cup Tuesday at Pint Sized Baker!